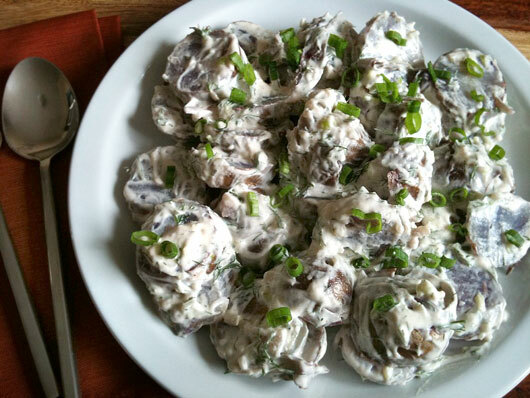 I whipped up a quick alternate version of this past weekend's Tangy Purple Potato Salad with the remaining purple potatoes I'd boiled. This one uses Vegenaise in place of mayo. You can use any vegan mayonnaise you choose (or regular mayo if you want to just be vegetarian for this meal) but for the best taste, I can't suggest Vegenaise enough. I have friends who have switched from mayo to Vegenaise, simply because it tastes so good! Any type of potatoes will also work well, but purple potatoes will add vibrant color and a sweet taste. Boil the potatoes: Bring a large pot of cold water to a boil. Place the potatoes in the boiling water, cover and simmer until the potatoes are tender when pierced with a fork, about 12 - 15 minutes. Drain the potatoes and slice 1/4-inch-thick rounds. Prepare the dressing: Whisk together the lemon juice, mayonnaise, dijon, scallion whites and chopped dill. Season with salt and pepper to taste. Place the potatoes in a serving dish and pour the dressing over them. Toss gently until just coated. Garnish with scallion greens and serve.